These are the new Falkirk FC kits 2015/16, the new home and away tops for Scottish Championship side Falkirk FC. The Bairns narrowly missed out on a spot in the playoffs, finishing 5th in the league, behind Hearts, Hibs, Rangers and Queen of the South. 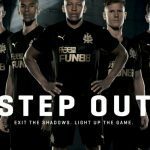 Their new kits have been made by Puma and were officially unveiled on 4th May, 2015. The kits also contain a 10 under the sponsor logo to mark ten years of sponsorship from Central Demolition, as can be seen in the pics below. 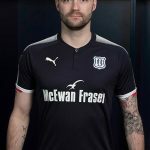 The blue jersey is Falkirk FC’s new home shirt, with white set to serve as an alternate. This entry was posted in SPFL/Scottish Premiership and tagged Puma on May 5, 2015 by Football Kit News. Like them. Still an expensive polo shirt though. puma has so many horrible designs, this one is pretty good though. terrible socks.